With the turn of another calendar year comes the promise of new beginnings. To many, that means resolving to spend more time with loved ones or to finally dust off the treadmill in the garage; for attorneys, it means a chance to review both the successes and setbacks of the previous year and to look for new opportunities for growth. Today, law firms have more ways than ever to reach potential clients. While there are many marketing channels your practice can explore, social media continues to be one of the most effective, and Facebook should be at the top of your list of platforms to use. That site alone has more than 1.3 billion users, including 80 percent of your target audience! 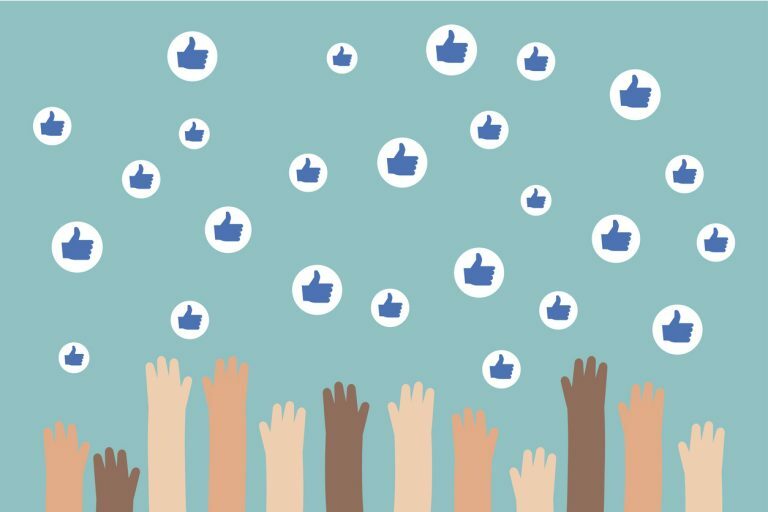 To get the most out of Facebook, check out these four trends that will help law firms get more clients in 2018. It has been more than two decades since Bill Gates first declared that “Content Is King,” and marketers continue to live by that mantra today. While that philosophy may not have changed for 2018, ever-evolving trends in social media continue to create new avenues for your firm to deliver compelling content to your target audience. User-generated content is not only a great way to build your brand but also helpful in establishing yourself as a thought leader in the legal community. You should regularly post articles that address questions clients would have about their case or about the legal process in general. If you’re looking for ways to improve your referral marketing strategies, make an effort to engage with and share content from other businesses and even attorneys that practice different areas of law. Facebook’s live video feature has exploded in popularity since its debut in 2016, and savvy business owners are taking full advantage of the tool to interface directly with their online followers. As the legal industry continues to grow, individuals are finding it more difficult to choose the right attorney for their case because the number of options has become so overwhelming. Online ratings are now one of the first things potential clients consider when searching for a lawyer, and while many individuals turn to Google, Avvo, and Justia, Facebook is still among the leading platforms for law firm reviews. How did the attorney handle their case? Were they satisfied with the results? Would they recommend the attorney and the firm to others? 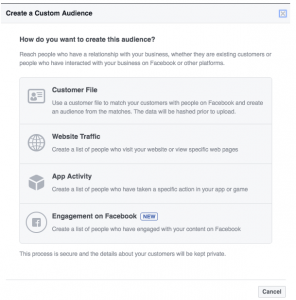 Many lawyers use paid advertising on Facebook to reach an audience that extends beyond their online followers. However, far too many attorneys overlook one of the most beneficial advertising tools that Facebook offers: remarketing. The mere-exposure effect is among the most powerful weapons in a marketer’s arsenal. Continually reminding your website visitors of the services you offer, even when they’re visiting other sites, will keep your firm in the front of their mind as they decide on legal representation. 1. Log in to the Ads Manager and select Audiences. 2. 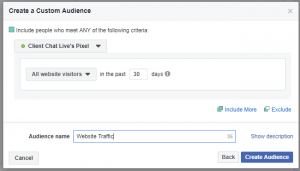 Click on Create Audience and choose Custom Audiences. 4. Customize your target audience. At Client Chat Live, we provide live operators ready to chat with your website visitors 24 hours a day, 7 days a week. Trusted by hundreds of law firms and other businesses across the nation, our service delivers a slate of options for customization and branding as well as monthly reports and analytics to help your business increase client acquisition. Call (808) 495-0932 or email us today to get started with a free quote.